In an agrarian village named Markelo this pronouncement was understood already in 1934 and was the occasion for the foundation of the Folkloristic Association Markelo. The objective was study and preservation of regional traditions ans habbits. 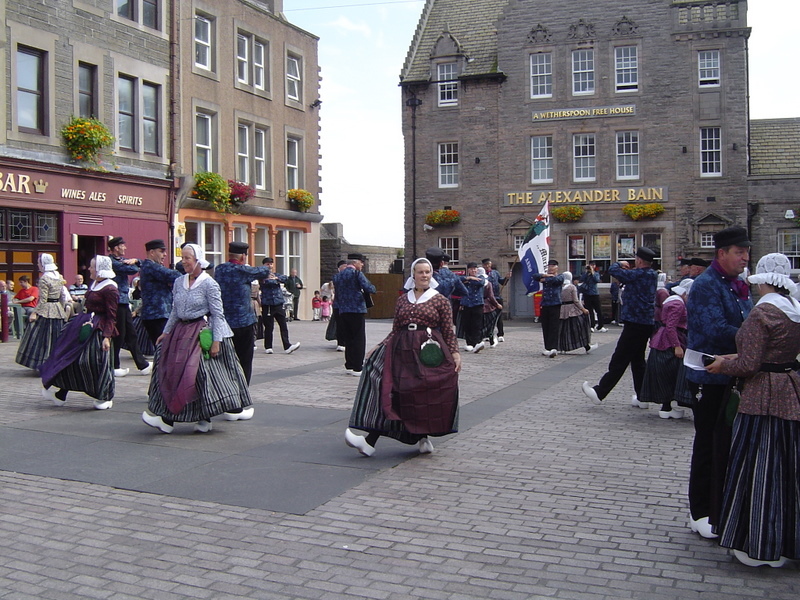 • Demonstrations off old regional dances in authentic clothing (from 1830) known as well in Europe as in other countries all over the world. 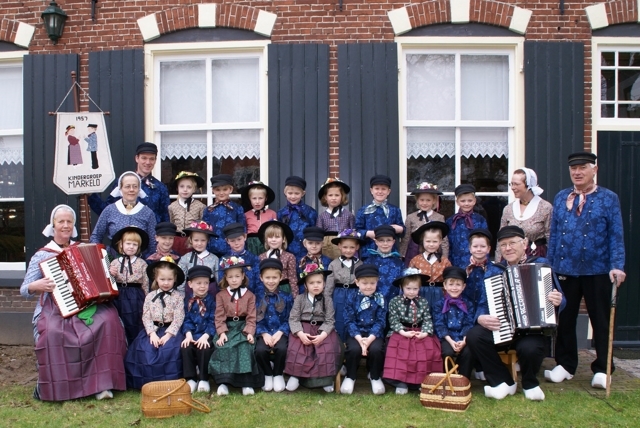 At the moment the Folkloristic Association Markelo counts about seventy members, between twentyfive and seventy years. The members are also active in organizing exhibitions in their clubhouse the Ëungs Schoppe, named after the family Eungs who was the owner of the farm. The repertoire consists from about twenty different dances every dance with its specific occasion and off course the typical names. The Folkloristic Association Markelo travelled all over Europe and other countries as Turkey and the USA were visited. We are very proud to show our costumes and dances as well in Holland as all over the world. 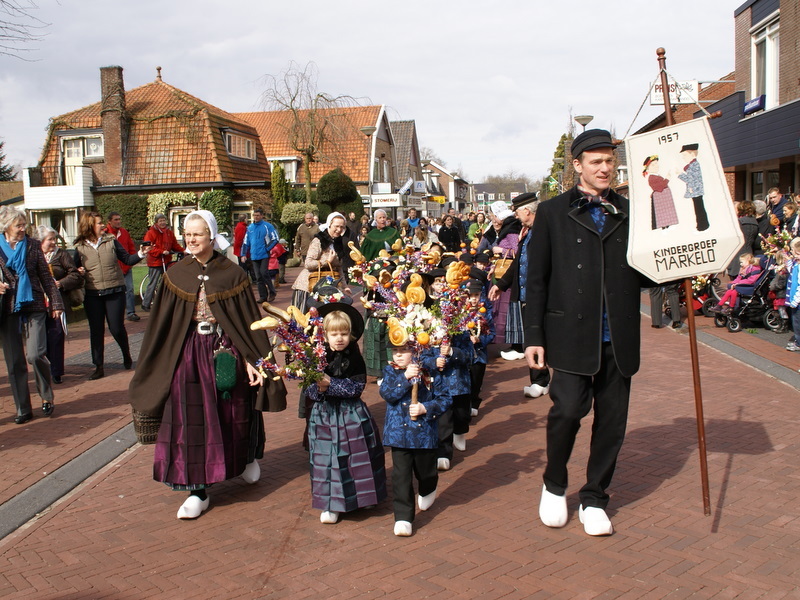 In 1957 the childrensgroup of the Folkloristic Association Markelo, also known as the Farmerdancers, was raised. 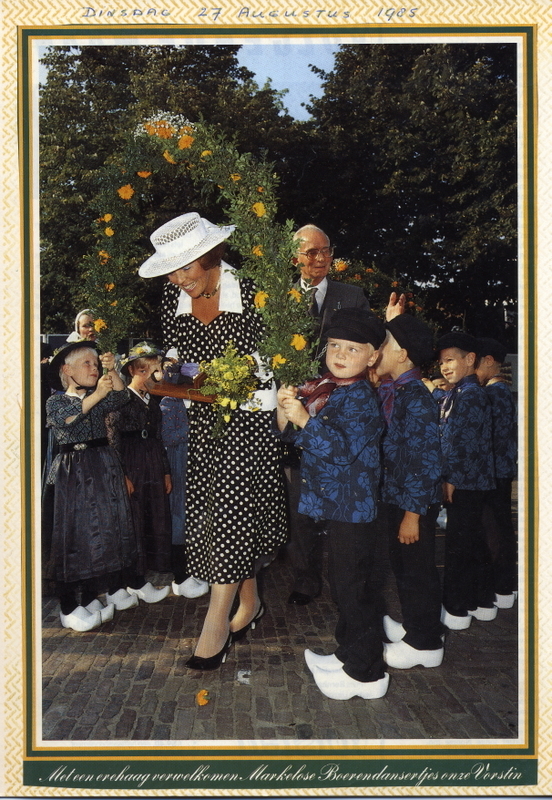 The occasion was the big festival ‘Gouden Aren’ (Golden Ares), a festival on the occasion of the celibration of a few associations from Markelo. The performance of the childrensgroup was very successful and they decided to create a new childrensgroup every two years in the age from six to eigtht years. The age of the children in the current childrensgroup is between four and six years. Every two years a new group. The costume is very typical and authentic for Markelo round 1860. 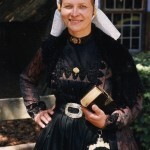 The skirts are made from the real old-fashioned moire fabric. The heads of the girls are old and original from all over Markelo. Further more the costume is in French style as the custumes from the adults group. The children have eight different dances and every new group has to study a lot. The first performance is on Palm Sunday. A parade of the childrensgroup, the brass band followed by a lot of kids goes through the streets of the village. At the end of the parade there is a performance with all dances. Performances take place all over the Netherlands for very various public. Even for the Queens Family there were several performances. The childrensgroup is always very succesfull and appreciated. Also a few groups performed on television. Here you can see a performence of the Childrensgroup at eastern. 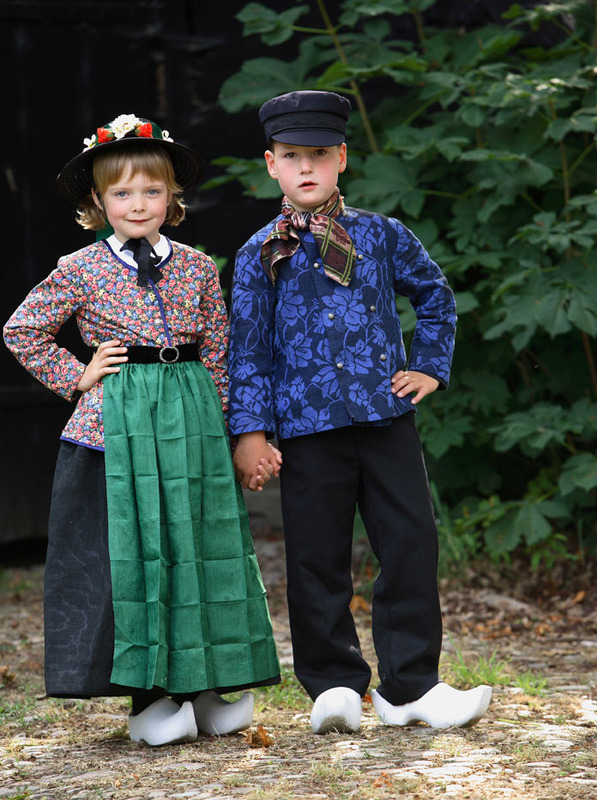 During a old fashion show you can see different oldfashioned clothing from the 19th and the 20th century , showed by our own members from the adult and childrens group. You can see what the farmers wear on sunday, when they went to church. And also when they are working on the farm. 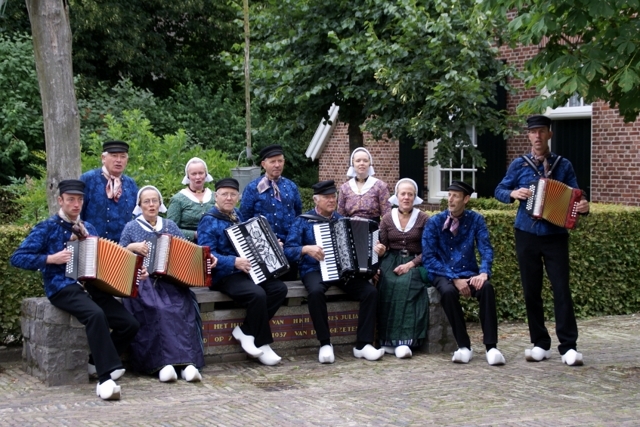 We have about 20 dances in our repertoire, specially from the eastern of the Netherlands. If you wish you can try to dance with us. We have some accordion players for live music and we sing by the most of the dances. 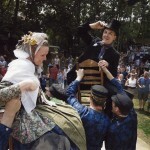 Until 1987 we performed every year in the open air theater in Markelo a Farmerswedding anno 1830. We can show you parts of this performance. When it is possible we use than horses and a cow for weddingpresent.